Interior of a rowing boat on The Cobb, at Lyme Regis, Dorset; 3 Nov 2004. The sunlit seat of the boat makes a powerfully gleaming, rectilinear shape on the left, which contrasts with its curved shadow further right. 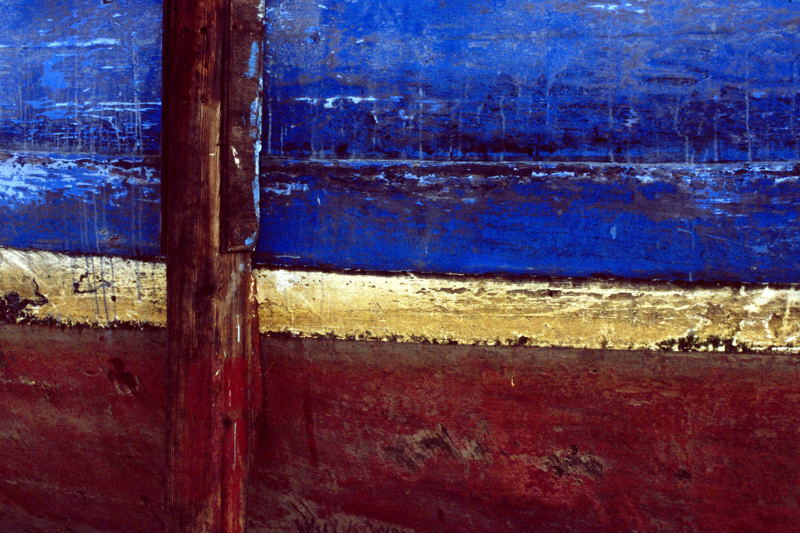 The boat’s scratched and battered floor provides an abstract background – with a small but darkly gleaming sprig of wet seaweed adding the sole touch of recogniseable reality. There is another rectangular shape on the right of the frame. Technique: Olympus OM-4 with 21mm Zuiko lens; Fuji Provia 400 colour slide rated at 1600 ISO; rotated 90 degrees anticlockwise. FANTASY: a wave, furrowed, swelling, dark, and with a thin, foaming apron of silver, rolls in towards the beach and meets a man. And there is a communion – something passes – between the moving water and that rigid figure with his dark suit, bowed head and tightly clenched fists. Is he bowing to the turbulent and rising water, acknowledging it perhaps as a living thing? Or, in a moment of shock and revelation, is he realising his own inadequacy in the face of this endless, remorseless and energetic swell? And, equally, in what way is the wave responding to him? Indifference, perhaps? Or, however muted and distant, is there some acknowledgement of another feature of this planet’s surface? And because this is an interpretation that exists only in my mind, I have used a pale vignette to separate this imagined interaction from the solid and all too permanent reality all around – the mist shifts, and we are granted a fleeting glimpse into a daydream. 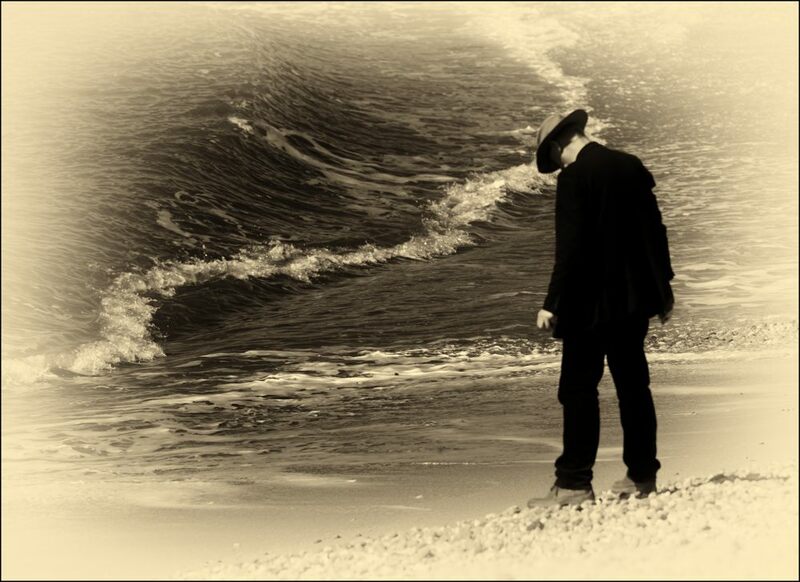 REALITY: a man, not a young man as I remember, walked down the beach in a dark blue suit, brown shoes and a wide brimmed hat, and remained standing there in the harsh sunlight, apparently transfixed by the sand and pebbles at his feet. What was he actually doing? His fists appear to be clenched but, magnifying things substantially, I think that his hands are in fact full of beach pebbles – and fossils too maybe on this famous Jurassic Coast. And he’s gazing down at the beach’s debris, hoping to add more to his collection. 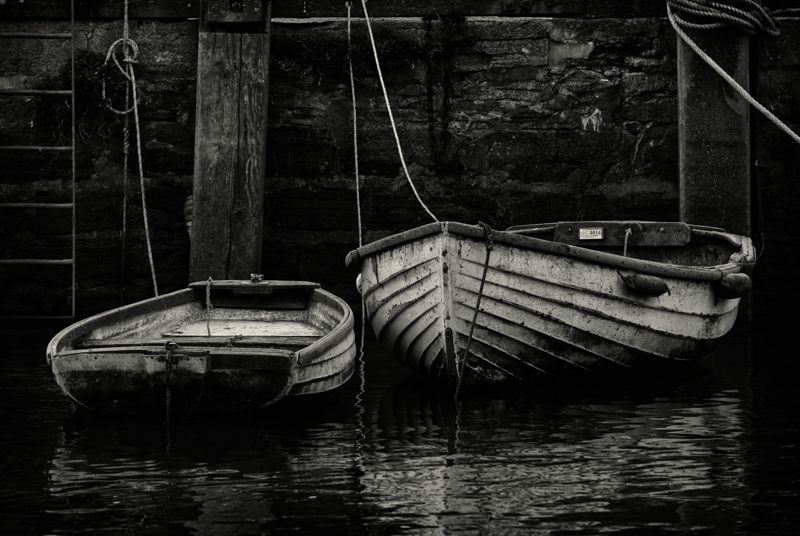 Technique: D800 with 70-300 Nikkor lens at 300mm; 200 ISO; Silver Efex Pro 2, starting at the Antique Portrait preset; West Bay, Dorset; 21 Apr 2015. In the harbour, West Bay, Dorset; 23 Apr 2015. D800 with 70-300 Nikkor lens at 300mm; 800 ISO; Silver Efex Pro 2, starting at the Low Key 2 preset. 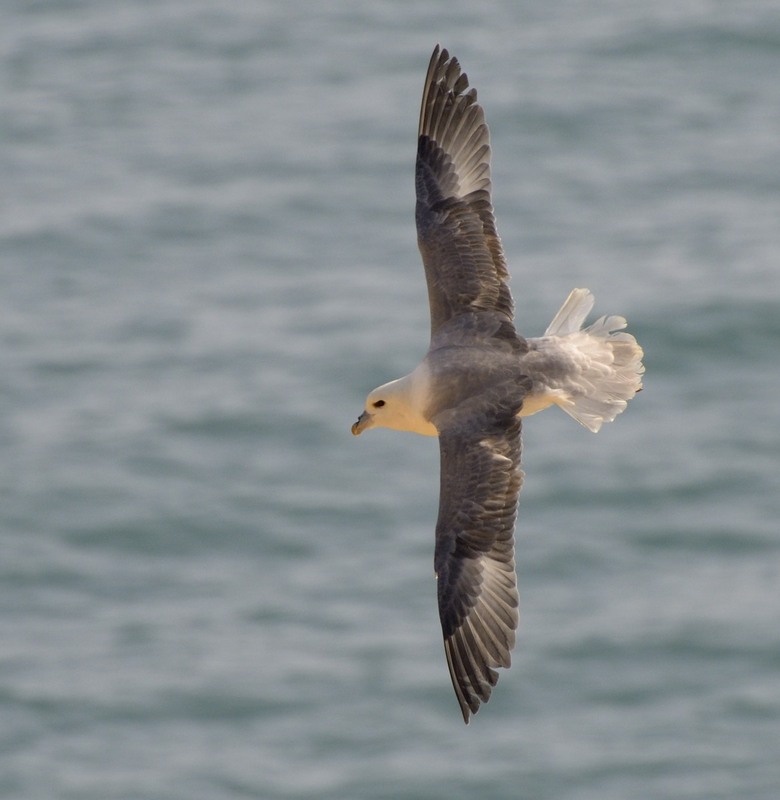 Fulmar flying around East Cliff; West Bay, Dorset; 23 April 2015. Looking very much like a seagull, this is in fact a true seabird that spends most of its life out on the open seas and only comes ashore to breed – the reason why this individual was around the cliffs at West Bay. 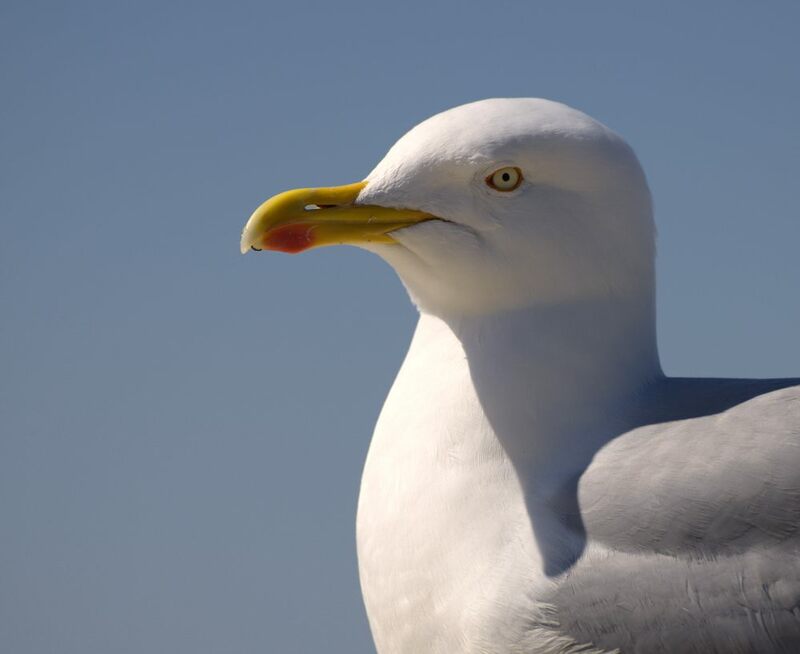 It can at once be told from a gull by the little kink and ridge on the top of its bill that houses nasal passages, something that gulls don’t have. And finally here’s a fascinating passage from Wikipedia: “Fulmars have for centuries been exploited for food. The engraver Thomas Bewick wrote in 1804 that “Pennant, speaking of those [birds] which breed on, or inhabit, the Isle of St Kilda, says—’No bird is of so much use to the islanders as this: the Fulmar supplies them with oil for their lamps, down for their beds, a delicacy for their tables, a balm for their wounds, and a medicine for their distempers. ….. James Fisher, author of The Fulmar (1952) calculated that every person on St Kilda consumed over 100 fulmars each year; the meat was their staple food, and they caught around 12,000 birds annually.”. But no, before you ask, I’ve never tasted one! And I recommend that St Kilda link – if only for the sounds of the sea! – I’ve never been there, but it was a constant and brooding presence, far off to the west, when I was on the Western Isles some years back. There is another Fulmar image, and more context, here. Click onto this image to open another version in a separate window, and click onto that image to enlarge it further. Technique: D800 with 70-300 Nikkor used at 300mm in DX (= APS-C) format to provide 450mm; 400 ISO. Thatched roof in Wareham, Dorset; 7 Nov 2006. 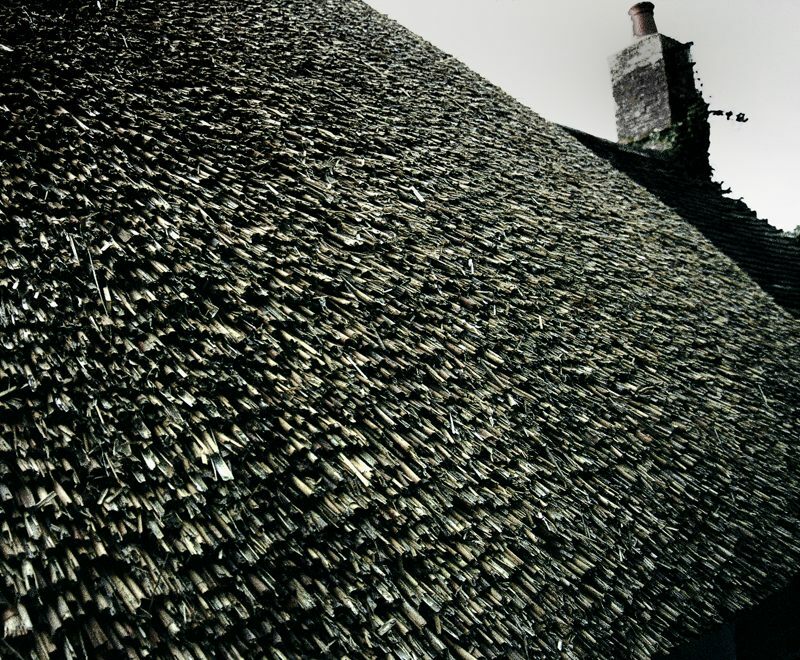 Technique: use of a 24mm wide angle lens, close in, emphasises the vast, rough bulk of the thatch, making it loom towards the camera, almost filling the frame. The chimney, totally outscaled, appears to be toppling, again as a result of the distortion of the wide lens. I originally intended this shot to be monochrome, but the slight tinges of colour in the thatch, the chimney and the plant improve it – instances of low key colour (in this instance, restored colour) adding something. Technique: F6 with 24-85 Nikkor at 24mm; Fuji Provia 400 colour slide rated at 1600 ISO; Silver Efex Pro 2, starting at the Neutral preset and selectively restoring colour. UPDATE: here is an image from sometime ago that I re-discovered while looking through my files. When you’re in my blog, its certainly best to click onto this image, to open a larger version in a separate window. 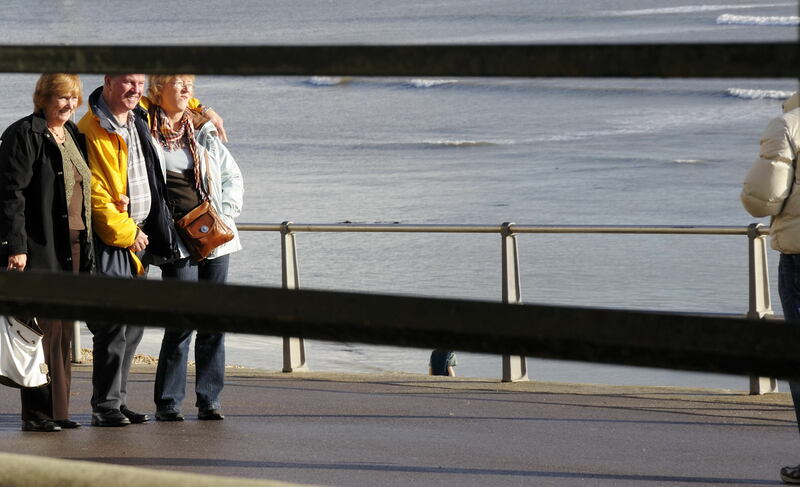 People being photographed on the promenade at Lyme Regis, Dorset; 5 Nov 2009. I rarely photograph people that I do not know, but here is an exception. We were lounging in a shelter beside the promenade at Lyme when these people stopped in front of us – and unwittingly offered me a photograph of both the photographed and the photographer – I had time for one frame. This is in some ways a strange shot, and some things can be surmised from it. Structurally, it has three distinct planes. 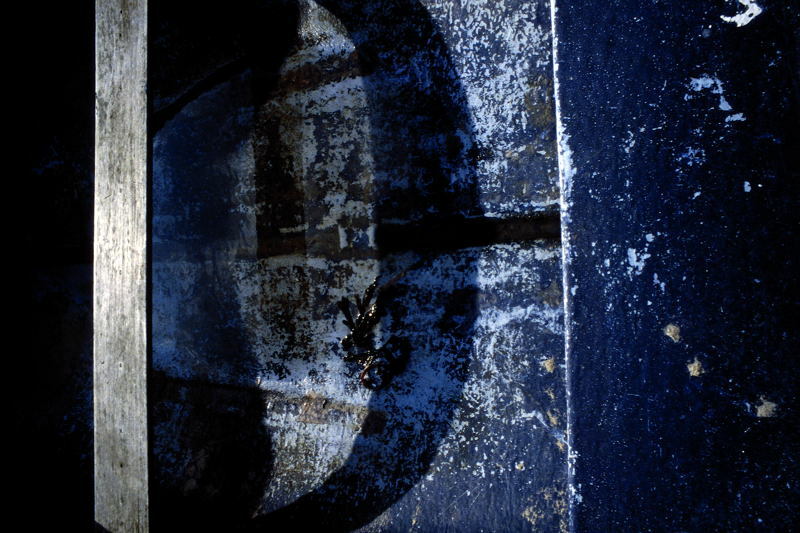 First, the camera is looking out from behind the low wall of the shelter, with a view harshly and uncompromisingly cut through by the shelter’s thick railings, which are in dark silhouette. Beyond this, the people are standing on the sunny promenade, which is itself bounded by yet more railings, this time lower, gentler and sunlit. And beyond this second set of railings is the sea, bluish and gentle, with a few wavelets. 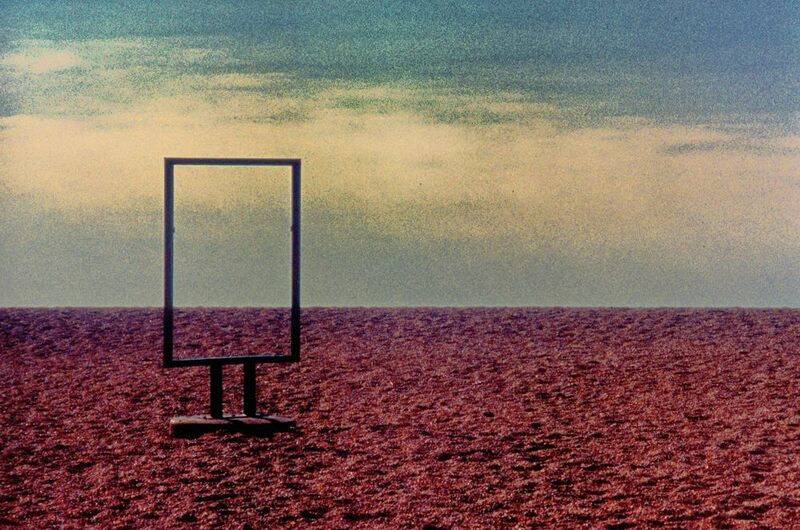 The distribution of people in the photo is also odd: the main subjects of the picture are towards its left and right edges – and, between and below them, an unknown, headless figure walks on the (virtually unseen) shingle of the beach. Then, some things can be surmised about the people themselves. First, they are having their photo taken in time honoured seaside fashion, squinting into almost painfully bright, low angle sunlight. The aim here is not to achieve a quality portrait of the group, but rather a quick memento of a happy day out together in the sunshine. Next, they are relations: the two women are sisters and these are their men / partners / husbands. The elder sister is nearest us, and her man is the photographer (from the photo, this could in fact be a third woman, but I remember that it was a man). The man standing next to her is with her younger sister, and he has his arm flung over her younger sister’s shoulders. Because her man is taking the photo, the elder sister feels slightly alone, and so puts her arm through that of her sister’s man, to feel and look more a part of the group. D700 with long end of 24mm-120mm Nikkor lens; 400 ISO. Terracettes at Up Sydling, near Cerne Abbas, Dorset; 3 Jul 2003. Terracettes are step-like features formed on steep slopes, when the soil detaches itself from the underlying rock and moves very slowly downhill under its own weight; this is soil creep. The steps mimic the puckering up of a loose table cloth being pushed across a table top. Here, at Up Sydling, high angle summer sunlight catches just the outside edges of the steps. The many pale and apparently floating flecks in the deep shadows are the seed heads of grasses caught by the sun – the grass stems are mostly in shadow. 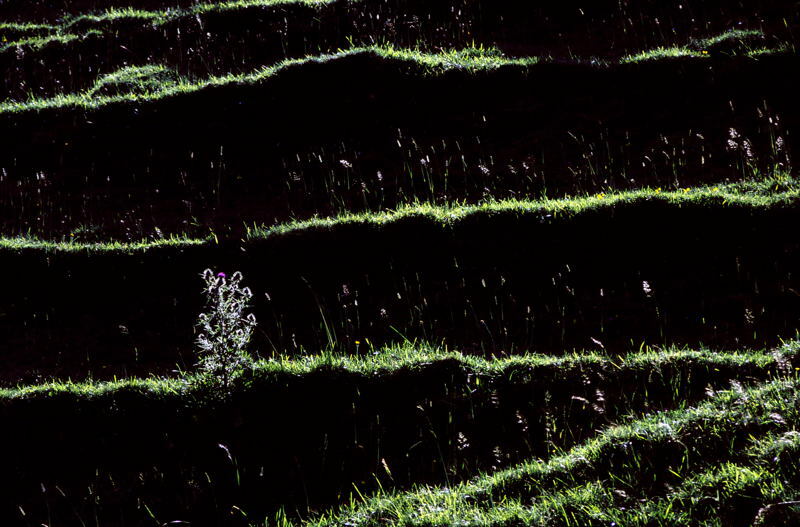 For me, two things contribute to this picture: the dark, massive, frame-filling hillside with its four bright green layers that contrast with the angle of the more fully illuminated grassy ridge at the bottom right of the photo. And then the brightly illuminated thistle with its tiny spot of bright colour, which is just about on the intersection of the lower and left thirds of the composition. Clicking onto the image opens a slightly larger version in a separate window. OM-4 with 85mm-250mm Zuiko; tripod; Fuji Velvia 50 colour slide. And finally, a decade later, a little (but only a little) tweaking in CEP4. If your eyes can stand it – no free sunglasses on this blog! – you can see a larger version of this image by clicking onto it. OM-4 with 75-150 Zuiko at 150mm; Fuji Provia 400 colour slide rated at 1600 ISO; Color Efex Pro 4. Adult Herring Gull, resting in glorious sunshine, beside the harbour at West Bay, Dorset; 21 Apr 2015. Immaculate! An inveterate and highly aggressive and successful scavenger, thief and killer. And, at the same time, a creature of vast natural beauty. So what skews our judgement of him – if we are fit to judge – what he does or what he is? 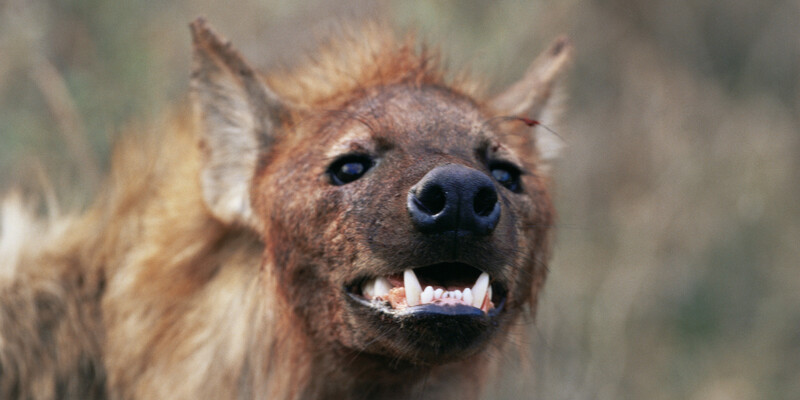 After all, if beauty is function, even the Spotted Hyaena is beautiful. But of course – as regular readers of this blog will know – when it comes to gulls I’m biased! D800 with 70-300 Nikkor at 300mm; 200 ISO; Color Efex Pro 4. Fishing boat hauled up onto the quay; the harbour at West Bay, Dorset; 5 Nov 2008. F6 with 70-300 Nikkor; Fuji Provia 400X colour slide, rated at 1600 ISO.